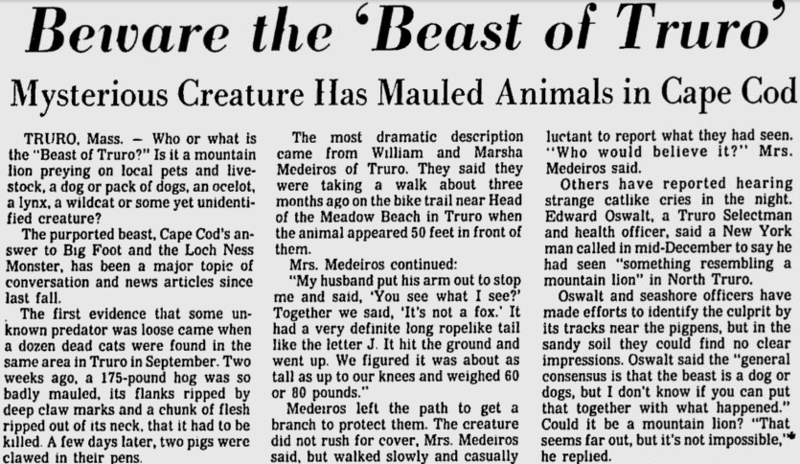 Cape Cod Wildlife Calling→Blog→Wildlife→Remember “The Beast of Truro”? 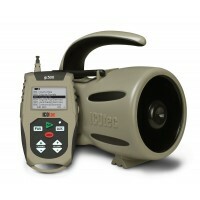 ← Turkey Calling = Predator Calling → Watch Your Back! Remember “The Beast of Truro”? Who remembers the story of “The Beast of Truro” aka “The Pamet Puma”? In 1981, pet cats and livestock were found slaughtered in different areas of Truro. Rumors were flying that a panther or mountain lion was on the loose and responsible for the killings. At first, these killings were attributed to the actions of stray dogs, but some people described hearing strange noises at night. A few witnesses came forward and reported seeing an animal that was clearly not anything native to the area. It was described as a large animal, similar to a small mountain lion, but with a long, rope-like tail. Oswalt and seashore officers have made efforts to identify the culprit by its tracks near the pigpens, but in the sandy soil they could find no clear impressions. Oswalt said the “general consensus is that the beast is a dog or dogs, but I don’t know if you can put that together with what happened.” Could it be a mountain lion? “That seems far out, but it’s not impossible,” he replied. Who or what was the ‘‘Beast of Truro?’’ Was it a mountain lion preying on local pets and livestock, a dog or pack of dogs, an ocelot, a lynx, a wild cat or some yet unidentified creature? The first evidence that some unknown predator was loose came when a dozen dead cats were found in the same area in Truro in September of 1981. A 175-pound hog was so badly mauled, its flanks ripped by deep claw marks and a chunk of flesh ripped out of its neck, that it had to be killed. A few days later, two pigs were clawed in their pens in another part of town. Mrs. Medeiros continued: ‘‘My husband put his arm out to stop me and said, ‘You see what I see?’ Together we said, ‘It’s not a fox.’ It had a very definite long ropelike tail like the letter J. It hit the ground and went up. We figured it was about as tall as up to our knees and weighed 60 or 80 pounds. Mr. Medeiros left the path to get a branch to protect them. The creature did not rush for cover, Mrs. Medeiros said, but walked slowly and casually along the path in front of them before disappearing into the nearby woods. The Medeiroses are sure that they saw a mountain lion. ‘‘What we saw fits that description,’’ said Mrs. Medeiros. At first the couple was reluctant to report what they had seen. ‘‘Who would believe it?’’ Mrs. Medeiros said. Others had reported hearing strange catlike cries in the night. Edward Oswalt, a Truro Selectman and health officer, said a New York man called in mid-December of 1981 to say he had seen ‘‘something resembling a mountain lion’’ in North Truro. via The Beast of Truro – CapeLinks Cape Cod. So what was the beast of Truro?